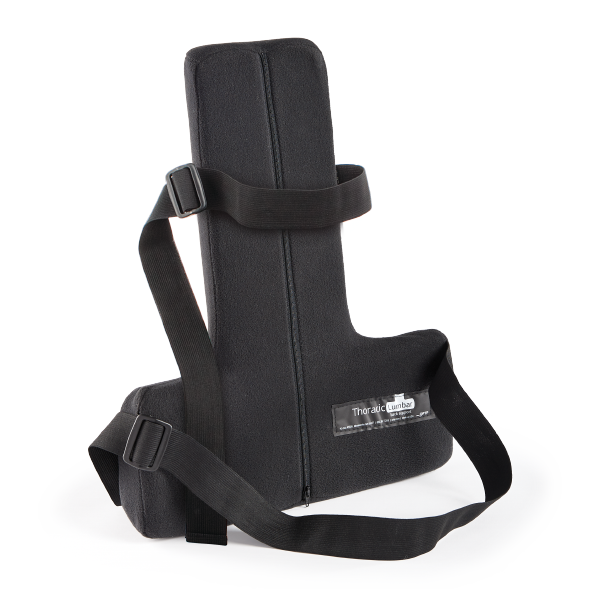 More than a lumbar support, OPTP's Thoracic Lumbar Back Support™ addresses the entire back, promoting correct sitting posture to help relieve back pain, shoulder pain and neck pain. 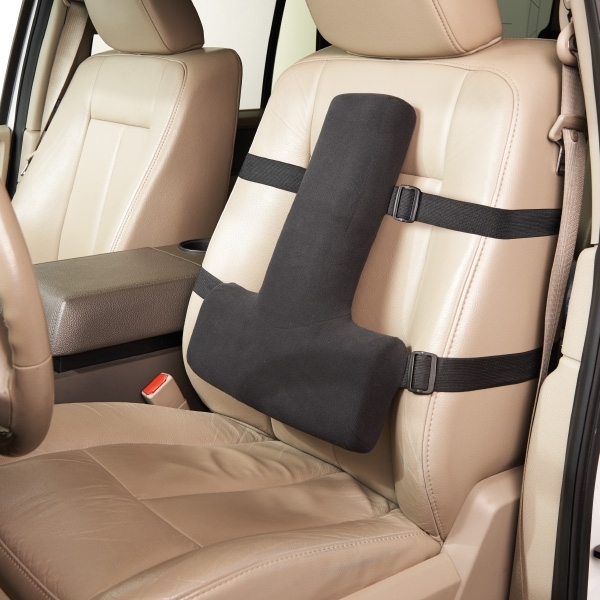 Simply attach the support to any type of seat. 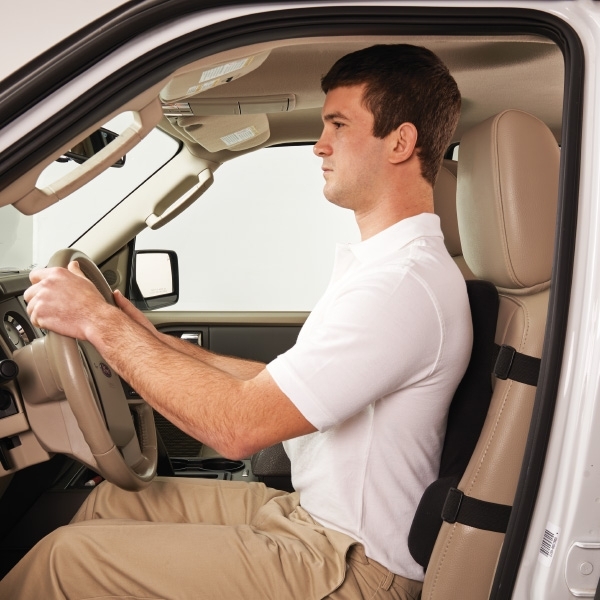 The Thoracic Lumbar Back Support is recommended for offices, cars, semi trucks, classrooms, couches, airplanes, buses, tractors, construction equipment, theatres, sports arenas/stadiums, and anywhere else people sit for extended periods. Constructed of high-quality foam with a removable, washable Polartec® cover and adjustable elastic strap. Strap contains latex. Measures 18"H x 14"W x 2"D; vertical thoracic pad is 5½"W.
I have multiple back and neck issues ( including SI dysfunction and DDD with annular tears). I have been in search of a comfortable chair ( for more than 20 min!) for years. Multiple chair purchases have ended up being a waste of money. Amazingly, this one cushion has been the inexpensive solution! I use it with a kitchen chair and it gives great support to my entire back! Well worth the money! I&apos;m having a hard time getting it to stay in place, but I think that&apos;s because the chair is a weird shape. Once I&apos;ve propped it up behind my back it feels great! I really appreciate the depth of the support. Other, more expensive, T/L supports need additional material placed between itself and the chair. 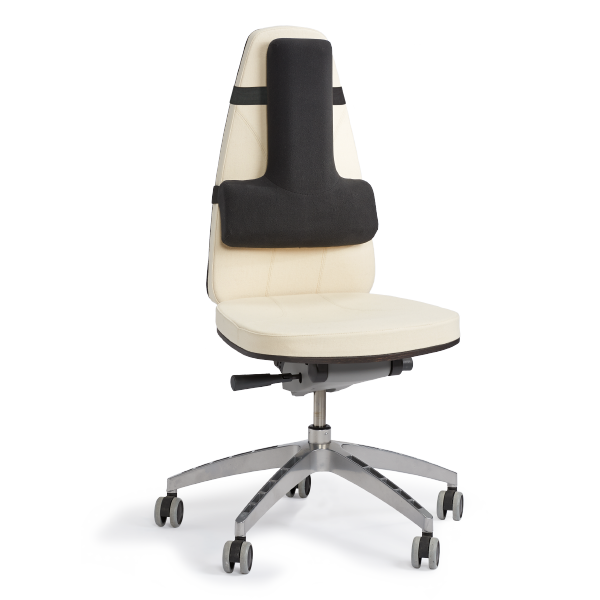 This model has enough thickness to provide support while maintaining an engaged pelvis at the front of the chair. It did take a day or two to get used to, but so far it is my favorite. I do couple it with a pelvic support. 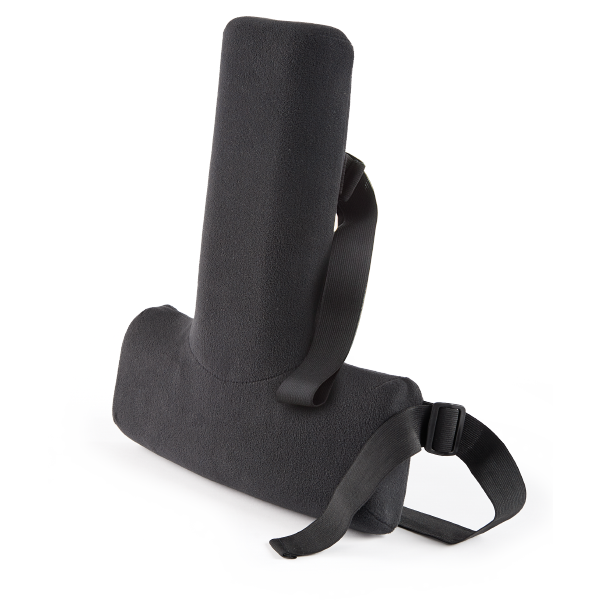 I love that this product includes lumbar support as well as thoracic which is great for overall spinal posture. I wish there was another strap near the thoracic portion because it keeps falling forward/ moving when you shift positions in your chair and move to standing. This is definitely a little bulkier than the traditional lumbar support, but I think overall a great investment if you spend a lot of time sitting! Hello Chad, Thanks for submitting a review! Just wanted to follow up and let you know that we've taken your feedback into consideration for this product -- we now have an additional top strap that keeps the support securely fastened to the chair and eliminates looseness at the top. This product is fabulous, better than any other I have tried over the years. Thank you! This is the best back support I&apos;ve tried yet. It has the cushion for your lower back, just like all the others, but the pad running up your spine is the best part. When you lean back on it, it feels like your shoulders pull back a little, so you&apos;re not all hunched over. I&apos;m at a computer most of the day and I actually feel comfortable while I&apos;m sitting "correctly." My friend&apos;s Physical Therapist recommended it for her and she told me about this product.